Everest Pharmacy are a local community pharmacy chain providing a free prescription collection and delivery service from all surgeries across the Greater Manchester area, directly to the comfort of your home. Since our establishment in 2009, Everest Pharmacy has grown substantially to four branches, however our values and mission remain the same, to provide healthcare at its peak. They are one of a new chain of smart, modern pharmacies utilising the latest technology, and it was only natural that they would want a stunning new website to go with it. After researching digital agencies based in Manchester, they invited us in to pitch for the contract, and we impressed them with our technical expertise, creative passion and enthusiasm. 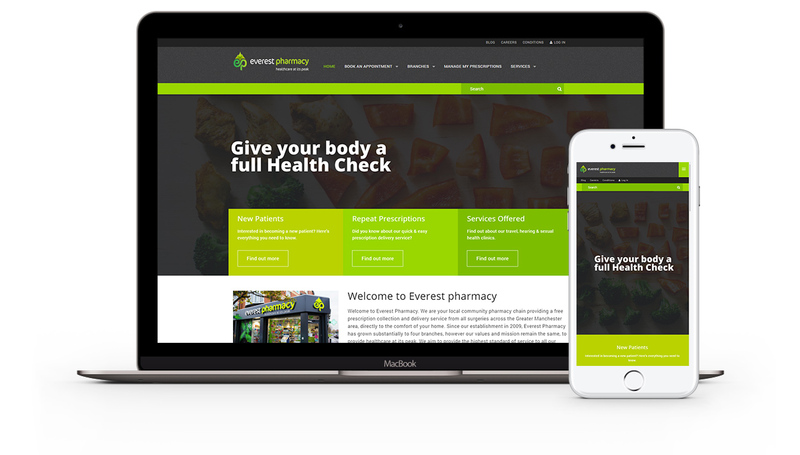 The next step of our relationship with Everest Pharmacy will shortly be to improve their Google rankings and increase traffic to their website via an intensive 12 month SEO & online marketing campaign.